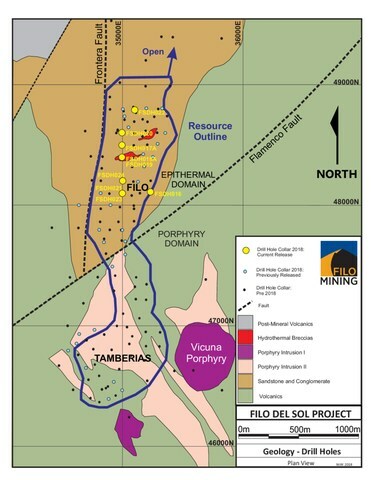 Filo Mining Corp. | Filo Mining drills 130 metres of 1. VANCOUVER, May 31, 2018 /CNW/ - Filo Mining Corp (TSX-V, Nasdaq First North: FIL) ("Filo Mining", "Filo", or the "Company") is pleased to announce the final assay results from the recently completed 2017/18 drill program at the Filo del Sol project in San Juan Province, Argentina and Region III, Chile. A total of 9,411 metres was drilled during the program, which was completed at the end of March, 2018. In total, 31 reverse circulation holes and 9 diamond drill holes were completed. Assay results for the 9 diamond drill holes are presented here. Results of the reverse circulation holes are contained in previous news releases dated April 27 and May 16, 2018. Commenting on today's results, Adam Lundin, CEO of Filo Mining stated, ""We are very pleased with the final drill results revealed from our 2017/18 field program at Filo del Sol. The results released today along with the first two sets of program results released in April and May of this year, respectively validate the Company's confidence in moving forward to complete an updated mineral resource estimate, and its in-progress efforts to release a Pre-Feasibility Study ("PFS") in early 2019." Filo del Sol is a large high-sulphidation epithermal copper-gold-silver deposit. The upper portion of the deposit is oxidized and includes from top to bottom, a gold oxide zone, a copper-gold oxide zone and a silver-rich zone. The oxide portion of the deposit is underlain by copper-gold sulphide mineralization. The drill holes reported here tested all of the oxide zones. One of the main goals of the 2017/18 drill program was to convert a part of the inferred oxide mineral resource to the indicated category. Diamond drilling was used in order to collect coarse sample material for column leach metallurgical testwork, as well as for resource infill. The mineral resource remains open laterally and to depth. The holes in this release span a distance of 730 metres from FSDH021 in the south to FSDH022 in the north. The Filo gold oxide zone was intersected by the upper part of FSDH017A (58m @ 1.09 g/t gold) and FSDH020 (122m @ 0.67 g/t Au) 140 metres to the north. Drill holes FSDH021 and FSDH023 intersected the southern high-grade copper zone within the indicated mineral resource, confirming the size and tenor of this zone and providing material for metallurgical testwork. Hole FSDH017A intersected the northern high-grade copper zone, 400 metres northwest of FSDH021 and hole FSDH022 intersected a shallower high-grade zone 400 metres north of FSDH017A. The intersection in FSDH022 included a very high-grade section of 8 metres that returned 12.8% Cu. This zone remains open to the north. Hole FSDH019 was abandoned just above the copper zone. Four of the holes intersected the silver zone, including another broad zone of near-surface mineralization starting at 30 metres down the hole in FSDH016 (62m @ 103.1 g/t silver). The silver zone intersections included some very high silver values (4m @ 1,001.0 g/t Ag in FSDH016; 6m @ 798.7 g/t Ag in FSDH021 and 4m @ 1,498.0 g/t Ag in FSDH023) as is typical within this zone. The silver zone intersections in holes FSDH021 and 023 are within the indicated mineral resource while those in FSDH016 and 017A are within the inferred mineral resource. The results of the 2017/18 drilling will be incorporated into an updated mineral resource estimate to support the PFS which is currently underway. The PFS follows the completion of a Preliminary Economic Assessment ("PEA") of the project, the results of which were released by the Company on November 28, 2017. The PEA incorporated open-pit mining and heap leach processing of only the oxide portions of the deposit. The results of the PEA demonstrate a robust project with strong economics, highlighted by an estimated after-tax NPV of US$ 705 million using a discount rate of 8% and an IRR of 23%, with an average estimated annual life of mine production of approximately 50,000 tonnes of copper, 115,000 ounces of gold, and over 5 million ounces of silver. Diamond drill holes completed during the 2017/2018 program will contribute data for the mineral resource update and will also provide samples for metallurgical testwork forming an important part of the PFS. Metallurgical sample material was also collected from surface trenches during the field program. The PFS metallurgical testwork program is being carried out at SGS Minerals lab in Lakefield, Ontario and commenced in early April, 2018. Ongoing environmental and social programs continue in support of the PFS and to lay the groundwork for future environmental assessments and project permitting. Samples were collected at the drill site by Company personnel with splitting carried out at the Company's field camp near the drill sites. Individual samples represent final splits from 2 metre intervals down the hole. Samples were delivered to the ALS preparation laboratory in Copiapo, Chile where samples were crushed and split and a 500g split was pulverized to 85% passing 200 mesh. The prepared samples were sent to the ALS assay laboratory in Lima, Peru. ALS is an accredited laboratory which is independent of the Company. Gold analyses were by fire assay fusion with AAS finish on a 30g sample. Copper and silver were analysed by atomic absorption following a 4 acid digestion. Samples were also analyzed for a suite of 36 elements with ICP-ES and a sequential copper leach analysis was completed on each sample. Copper and gold standards as well as blanks and duplicates (field, preparation and analysis) were randomly inserted into the sampling sequence for Quality Control. On average, 9% of the submitted samples are Quality Control samples. The PEA study results in this press release are only intended to provide an initial, high-level summary of the project. The PEA is preliminary in nature and includes the use of inferred mineral resources, which are considered too speculative geologically to have the economic considerations applied to them that would enable them to be categorized as mineral reserves and there is no certainty that PEA results will be realized. Mineral resources are not mineral reserves and do not have demonstrated economic viability. The Filo del Sol Project, the Mineral Resource estimate, and the PEA are described in a Technical Report titled "Independent Technical Report for a Preliminary Economic Assessment on the Filo del Sol Project, Region III, Chile and San Juan Province, Argentina" dated December 18, 2017, with an effective date of November 6, 2017 (the "Technical Report"), which was prepared for Filo Mining by SRK Consulting (Canada) Inc ("SRK"). The Technical Report is available for review under the Company's profile on SEDAR at www.sedar.com and on the Company's website at www.filo-mining.com. This information is information that Filo Mining Corp. is obliged to make public pursuant to the EU Market Abuse Regulation. This information was submitted for publication, through the agency of the contact person set out below, on May 31, 2018 at 1:00 a.m. Pacific Standard Time. 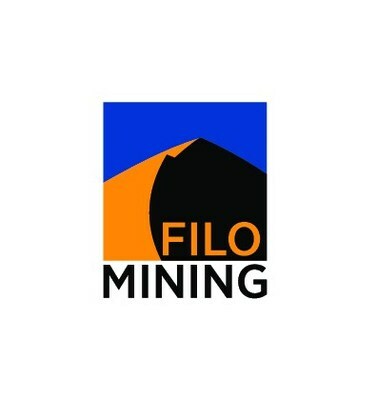 Certain statements made and information contained herein in the press release constitutes "forward-looking information" and "forward-looking statements" within the meaning of applicable securities legislation (collectively, "forward-looking information"), concerning the business, operations and financial performance and condition of Filo Mining Corp. The forward-looking information contained in this press release is based on information available to the Company as of the date of this press release. Except as required under applicable securities legislation, the Company does not intend, and does not assume any obligation, to update this forward-looking information. Generally, any statements that express or involve discussions with respect to predictions, expectations, beliefs, plans, projections, objectives, assumptions or future events or performance, (often, but not always, identified by words or phrases such as "plans", "expects" or "does not expect", "is expected", "budget", "scheduled", "estimates", "forecasts", "intends", "projects" , "estimates", "budgets", "scheduled", "forecasts", "assumes", "intends", "strategy", "goals", "objectives", "potential", "possible", "anticipates" or "does not anticipate", or "believes", or variations of such words and phrases or statements that certain actions, events, conditions or results "will", "may", "could", "would", "should", "might" or "will be taken", "will occur" or "will be achieved" or the negative connotations thereof and similar expressions) are not statements of historical fact and may be forward-looking statements. All statements other than statements of historical fact may be forward-looking statements. Forward-looking information is necessarily based on estimates and assumptions that are inherently subject to known and unknown risks, uncertainties and other factors that may cause the actual results, level of activity, performance or achievements of the Company to be materially different from those expressed or implied by such forward-looking information, including but not limited to: risks and uncertainties relating to, among other things, the inherent uncertainties regarding mineral resource estimates, cost estimates, changes in commodity prices, currency fluctuation, financing, unanticipated resource grades, infrastructure, results of exploration activities, cost overruns, availability of financing, materials and equipment, timeliness of government approvals, taxation, political risk and related economic risk and unanticipated environmental impact on operations, as well as other risks and uncertainties more fully described under "Risk and Uncertainties" section of the Company's most recent MD&A and in the Company's most recent Annual Information Form under the heading "Risk Factors", and elsewhere, which are available under the Company's profile at www.sedar.com and on the Company's website. These risks and uncertainties may cause the actual results, level of activity, performance or achievements of the Company to be materially different from those expressed or implied by such forward-looking information. The Company believes that the expectations reflected in the forward-looking information included in this press release are reasonable, but no assurance can be given that these expectations will prove to be correct and such forward-looking information should not be unduly relied upon. This forward-looking information speaks as of the date of this press release. Forward-looking information in this news release includes, but is not limited to, statements regarding the Company's expectations with respect to conversion of inferred mineral resources to indicated mineral resources, timing of an updated mineral resource estimate to support a PFS, the assumptions used in the mineral resource estimates for the Filo del Sol project; expected timing with respect to completion of a PFS, expectations with regard to potential for adding to mineral resources through exploration; estimations of commodity prices, mineral resources, and costs.